The 83 Annual Academy Awards are tonight. In less than three hours to be exact. I could dedicate this space to share with you my predictions, who I hope will and won’t win. I could analyze how there should only be five best picture nominees, how Michelle Williams should win best actress over Natalie Portman, or how we should expect that Hailee Steinfeld will pull an upset in the best supporting actress category. (Sorry, Melissa Leo.) But I don’t feel like doing that. By now any Oscars predictions, something I have been so focused on since November, have gotten old. I just want the ceremony to happen and be done with. What I do want to discuss however is the one topic that has been broken down so many times: The Social Network versus The King’s Speech. One received all the critics prizes and is said to define a generation. The other won the guilds prizes and is a rousing audience favorite. As we approach tonight’s awards ceremony it is The King’s Speech that is expected to win best picture. Since seeing The King’s Speech, I have been thinking about the very essence of what this movie is about: communication. In so many ways, The Social Network is about the same exact thing. The King’s Speech is set during a time when a leader could not stutter. Radio broadcasting provided the voice for the modern monarchy, making the king’s voice all the more important and powerful. King George VI (Colin Firth) and his unorthodox speech therapist Lionel Logue (Geoffrey Rush) work to overcome his crushing speech impediment throughout the film. The film’s cinematography works to show you how trapped King George is by his disability. (Think about how scenes rarely leaves the confines of indoor settings.) He isn’t really free, or the king of England for that matter, until that last radio address is complete. The direction and the cinematography have all been done before. What carries The King’s Speech is the story (someone rising from adversity is always a crowd pleaser) and the performances of Firth, Rush, and Helena Bonham Carter. The scenes between Firth and Rush are among the finest acting duets between two performers this year. Firth will rightfully win the best actor statuette tonight. Then there is The Social Network. It was only when I compared The King’s Speech to The Social Network that I really began to see the merit of the British historical drama. Where The King’s Speech fails to excite or offer any potential intellectual engagement, The Social Network more than makes up for. The pairing of director David Fincher and screenwriter Aaron Sorkin is something only the cinematic gods could conceive. Fincher does something incredible in The Social Network; he de-Sorkin’s Aaron Sorkin. The writer’s work is unmatched but his common character archetypes (neurotic white people!) and style (lots of walking and talking!) can deter audiences. But Fincher’s brilliant direction matches Sorkin’s dialogue to create the year’s sharpest film. But Mark Zuckerberg is no King George. He’s a pretentious, neurotic, know-it-all jerk. When your main character’s flaw is his personality and not something beyond his control, he is less than redeeming and likable. This is why audience’s favor The King’s Speech; it is more universally appealing. I can easily look past the tremendously annoying Mark Zuckerberg because of my own interests in what The Social Network is about beyond this character. Like The King’s Speech, The Social Network is about the importance and value of communication. Both films show how commication is constantly changing to reflect society’s needs. Unlike The King’s Speech, that is The Social Network‘s greatest flaw. The Social Network is all about the cultural impact that social media has had on our society. It is said that this movie defines a generation and it does. The impact of Facebook and social media is something I think people who are not constantly “wired in” don’t really like to think about. It is the unspoken quandary of social media; for every person who recognizes the value of it, there are countless people who don’t and who want our culture to remain the same. In the history of communications, The King’s Speech represents a more idyllic time that we can probably never go back to. The King’s Speech presents two men who didn’t need a Facebook connection to validate their friendship. The beauty of The Social Network is that it knows its cultural place, shows it, and doesn’t makes excuses for it. In the final scene of the movie all of the cultural implications of Facebook come to fruition. Mark Zuckerberg sits in front of his computer deciding whether or not to friend Erica Albright, Rooney Mara’s character whose searing words cut him down earlier in the film. Logically, he shouldn’t want to be Facebook friends with her but Facebook has changed how we view friendship. When Zuckerbeg loses the one real friend he has (Eduardo Saverin), he latches on to this intangible virtual connection. But we never see Erica accept his friend request. Why? Because what The Social Network ‘s filmmakers want you to question is the validity of the intangible relationships we can create now. And at the end of the day, do you really think about everything your Facebook page says about you? If you did, you would go crazy and not use social media. The King’s Speech, meanwhile, boldly lets you think about nothing. There is nothing on that screen for you to question about your own existence. It tells you how the story ends and that everyone involved lived happily ever after. So, naturally, why would you want to complicate your own existence and choose The Social Network as the best picture of 2010? No matter what happens tonight, the best picture race is the most culturally significant since 2005 when Crash upset Brokeback Mountain. But it is culturally significant in a more subtle way because of what people don’t want to acknowledge about themselves. 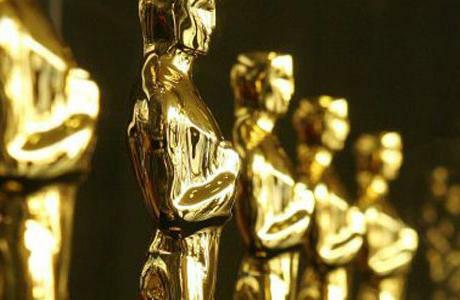 The Academy Award nominations have been announced. Now it is time for some fun. In the 127 Hours before the Inception of The King’s Speech, The Fighter learned that The Kids Are All Right because they had True Grit during Winter’s Bone when the Black Swan joined The Social Network to watch Toy Story 3. The rules are simple: it can only be one sentence and you have to include all ten. 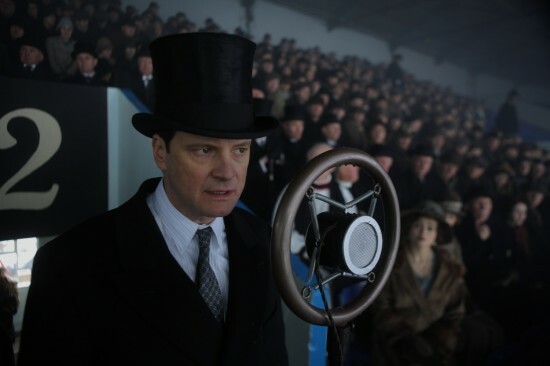 The King’s Speech, Tom Hooper masterful period film about King George VI and his st-st-stammer scored 12 nominations. After being shut out at the Golden Globes, Joel and Ethan Coen’s revamped True Grit followed with 10 nods. 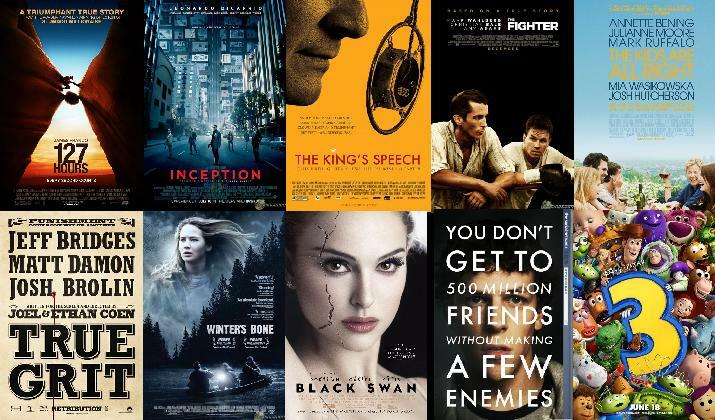 The Social Network received just eight nominations, as did Christopher Nolan’s Inception. Toy Story 3 became the third animated feature nominated for Best Picture. The complete list of nominations is available here. Other notable omissions are Julianne Moore for The Kids Are All Right and Ryan Gosling for Blue Valentine. Their on-screen spouse (Annette Bening and Michelle Williams, respectively) both received best actress nominations. For performances that are so symbiotic, it is a shame the other half was left off the ballot. I was also secretely hoping Barbara Hershey’s performance as the wonderfully creepy arand manic stage mother in Black Swan would score a supporting actress nomination. Are you satisfied with the Oscar nominations? What do you see as the biggest Oscar snubs? Sound off below. There are less than two hours until the Golden Globes. In lieu of predictions (which I don’t enjoy making when I haven’t had the luxury of seeing all the nominees), here is a brief round-up of what films I want to win. Why: The Social Network is a film for the ages. It is a sharp legal drama that questions not only the foundations of Facebook, but also our changing notions of how we conceptualize friendship. The director-writer pairing of David Fincher and Aaron Sorkin is the best combo to happen in American cinema in year. Why: Lisa Cholodenko’s film about a uncoventional family dynamic is funny, charming, heartwarming, heartbreaking. A Globes win will make up for any recognition this doesn’t get enough Oscar love. Why: The Oscar is Colin Firth’s award. But I would just love for Ryan Gosling to be commended for his awe-inspiring performance (or rather performances) as an idealistic young man and, years later, that same man as a down-on-his-luck alcoholic husband and father. Why: These are two gritty female performances. A beleaguered wife. A teenager trying to hold her family together. Natalie Portman is one piece of a theatrical art film; Williams and Lawrence are the very definition of great acting. Best Actor – Comedy: I have not seen most of the nominated performances. But I am sick of Johnny Depp always winning Golden Globes. (With two noms, for Alice in Wonderland and The Tourist, he is the most likely winner.) Jake Gyllenhaal’s performance is the only other I have seen. As much as I didn’t like Love and Other Drugs, could I live with Jake Gyllenhaal winning? I have no idea. Why: Annette Bening has already been lauded for her performance and Julianne Moore has been left behind. In a perfect world, Bening and Moore will tie. One performance cannot exist without the other. Why: Bale transforms into Dicky Eklund, the older half-brother of prize-fighter Mickey Ward. Dicky is a jail-bound, junkie. Bale’s performance is a demonstration of pure physicality and he steals the movie right out from under Wahlberg’s nose. Why: Amy Adams is one of the best female actresses in Hollywood. In The Fighter she is playing against type and shows off her range. Why: Have you seen The Social Network? 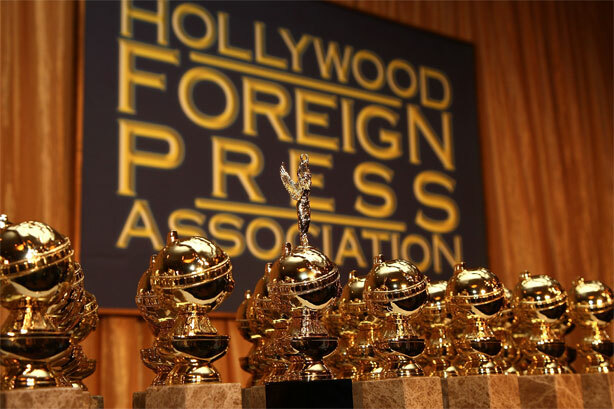 What are your picks for tonight’s Golden Globes? Sound off below and be sure to follow me on Twitter tonight (@cinefille) as I live-tweet the ceremony.